Lentils/beans are important part of diet in India. 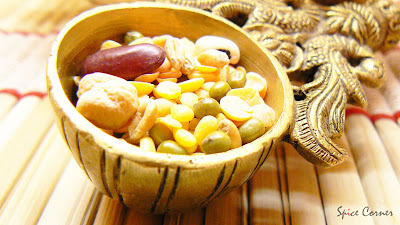 Be it plain rasam, sambar or dal lentils/beans are the main ingredients. I try to include lentils as much as possible as they are not only nutritious but also taste good. My hubby prefers dosa/pancakes for breakfast. Dosa can be made using just one ingredient. But here I am posting a recipe of dosa where I have used 9 different lentils/beans, so the name Navaratna which means 9 precious gems. The recipe source is of course my mother. Soak rice, fenugreek seeds and all lentils/beans in water for at least 4-5 hours or preferably overnight. Add poha, chillies and coconut and grind them to smooth paste adding enough water and salt to taste. Keep it over night to ferment the batter in warm place. I served this dosa with Coriander Chutney. Here is the ingredient and method for making fresh coriander chutney. Grind all the ingredients adding little water at a time to smooth paste. You can also season it with mustard and curry leaves. Your blog looks cool. Nice pictures and delicious recipes.Thanks for visiting my blog. By the way nice dosa recipe. MY family loves dosa's will try this sometime. Nice variant of Dosa. I will try navaratna dosa for sure. We used to have Adai Sosai on evenings at home. You must have tasted it. Read your "About Me" column today. Beautiful & creative writing. Navaratna dosa sounds very good and healthy. 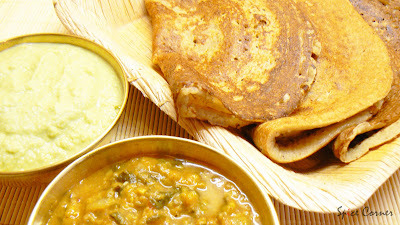 Whole wheat & lentils too..You haven't mentioned how much to add..I guess a handful of each..
Hi Sups.Dosa looks delicious,lot of protein and yummy side dishes.Where is the recipe for Soppin saaru?I am drooling over the picture!Liked the daily tip too.I wash onions sometimes but not always.Thanks. Btw,I checked my settings,nothing is wrong.I think it's the blogger problem. yup just small handful of each grains. Nice and nutritous recipe chuppakka. Ah! there is see your hale thatte? Did u get it this time from India? I remember you mentioning to me that u wanted to get some. Can't see pic. But recipe sounds good. Thanks for sharing. Sia, please post the recipe for soppu sambar - do you mean dill? I always see it but mostly hesitate to buy it because my dill repertoire is limited to one or two dishes. 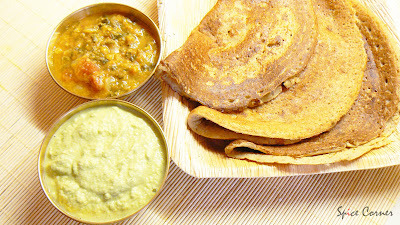 Most nutritous dosa recipe, it caters to all our nutrient requirements. though). End product was good. that was quick girl:) i really glad that u liked it. it takes quite sometime to cook but the end result is simply suberb, isn't it? Navaratna Dosa..hmmm.....name itself represents some richness. It was something new,but really i enjoyed the receipe from picture,what a colour,texture...so tempting.I hope sure your family would have enjoyed the taste too..
thats strange trupti... donno why blogger is not working right. mmm... if this continues for long i might change to someother blog. good luck with code:) if u need any help just drop me a line. Navaratna dosa sounds great and new to me. Great entry. Will try it. Love the pic of the dosa.looks so good.I am sure it tastes good too.thanks for sharing. Suppi, Looks like Andhramirchy has been stealing our recipes. Check out my latest post, I've given the details. I can see the pic now!!!!! Looks Cool!!!!! Its seems to be dosas all the way.. I just tomato dosa and now your navaratna nutritious dosa. Awesome looking dosa picture, Supriya. thanks girl. i am afraid i cant see ur blog. can you please leave ur blog url. i have left a comment on that blog seema. i donno what else to do abt it. it has become big prob seema. Wow, Sup! That looks delicious!! 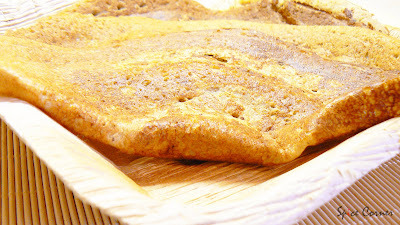 LOoks like a cross between dosa and adai and very nutritious too! And all the seasonings must give it a nice flavour. Good one, Sup! The dosa looks so good and nutritious, but it is thick... so is it good to make it thick and soft instead of thin and crunchy?? u can make it thick and soft or little thin and crispy according to ur preference. i usually make little thick batter as we like it that way and it remains soft for hours. Wow, what a nice idea of navratna dosa.